A bridal shower invitation with refined blossoms. The following fonts have been used in this shower invitation. Like this bridal shower invitation? You can personalize it with your own wording and details at weddingpaperdivas. 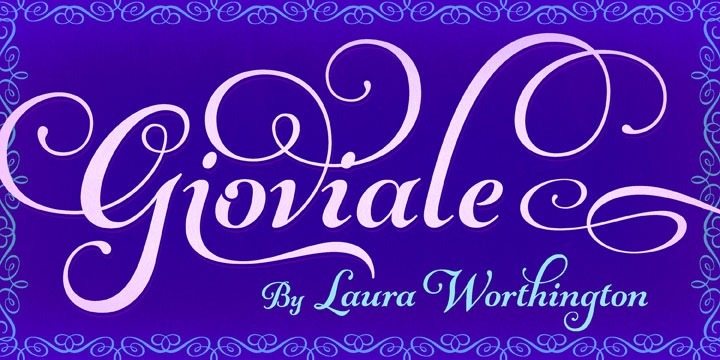 Gioviale is a calligraphic typeface designed by the American lettering designer Laura Worthington. It is a script that is handsome without being overly formal. With 1008 glyphs, an entire alternate set of swash caps, 20 ornaments, 20 discretionary ligatures, and an unusually high number of 300 swashes, Gioviale is an ideal typeface to create something tasty, al dente, a touch ornate yet fluent and full of life.